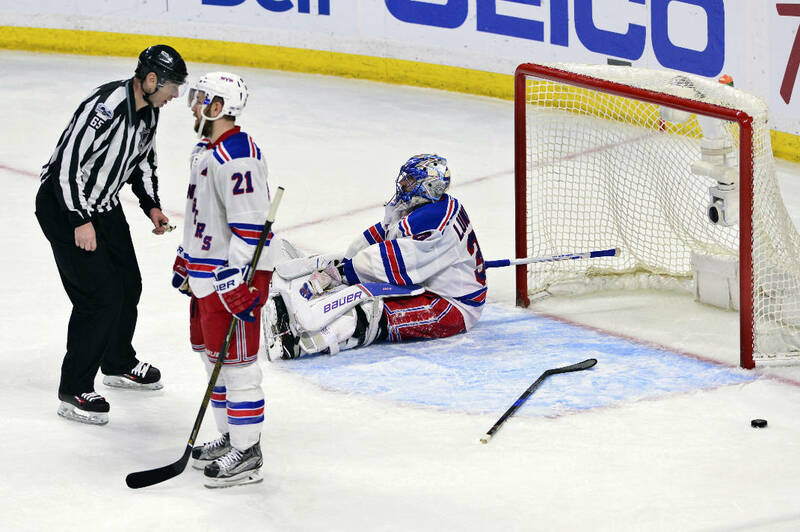 NEW YORK (AP) - The Rangers have had a tough time closing out against the Senators in Ottawa, a challenge they're eager to take on again. First, there's business to take care of in New York. After giving up another late lead before losing in overtime again on the road, the Rangers return home needing a win in Game 6 on Tuesday night to avoid elimination in their Eastern Conference semifinal series against Ottawa. "We have no time to waste right now," Rangers forward Jesper Fast said. The Senators took the series lead with a 5-4 overtime win in Game 5 on Saturday after tying the score with about 1 1/2 minutes left in the third period. It was the second time in the series Ottawa tied the score in the closing minutes at home before winning in the extra period. In Game 2, the Senators got two goals 2:17 apart late in the third before winning in the second overtime to take a 2-0 series lead. The Rangers evened it with two 4-1 wins at home before falling short in Ottawa again and will be trying for another big win at Madison Square Garden to force a decisive Game 7 back on the Senators' home ice. "They've been getting some resilient play in their building," New York defenseman Dan Girardi said. "Twice they tied it last minute - those are things we just got to battle through. We can't do much about that right now. We're just looking forward to getting in front of our fans, having a good start, get on the body, playing hard and hopefully just have a better work ethic out there." The Rangers, vying for their fourth trip to the conference finals in six years, have been in this position before in recent years - needing a win in Game 6 to extend a series. New York lost at home in Game 5 of the East finals against Tampa Bay in 2015, then won Game 6 on the road before losing at home in the deciding game. In the first round in 2013 against Washington, the Rangers lost Game 5 on the road before winning Game 6 at home and Game 7 on the Capitals' ice. In 2012 against the Senators in the first round, New York lost Game 5 at home before evening the series at Ottawa and winning back at the Garden. "Our group has been through quite a bit of them," Rangers center Derek Stepan said. "Our leadership group and the guys that have been around long enough can let guys know the importance of understanding that it's one game at a time. We'll talk to the group and make sure that we're ready to go and sharp." The Senators are seeking their first trip to the conference finals since a run to the Stanley Cup Final in 2007. To do it, Ottawa will need a better effort than the previous two games at MSG, when they trailed 4-0 before avoiding shutouts. "We got to play more of our game, we got to get off to a better start," said forward Kyle Turris, who scored the winner in Game 5. "We got to play within the defensive structure we played with all year, stick to it." The Rangers have been solid at home lately. After a late-season stretch in which they lost eight straight (0-5-3) at the Garden, a lackluster defeat to Montreal in Game 3 in the first round was their sixth straight on home ice in the postseason. However, they've won four straight there since. "All we can do is focus on tomorrow and do the best we can and force another game," goalie Henrik Lundqvist said Monday. "We believe in ourselves, we believe in the group we have here. We're just going to go out there and try to play our best game of the series and try to force another one. But we know they're going to come hard. We expect a tough one." If the Rangers win, Game 7 will be Thursday night in Ottawa.